At first Buba didn’t really take notice with Missy Moo. It wasn’t until she was about six months old that he started realizing there was another child in the house. Since then he has been ever so curious and down right obsessed with her. It’s touching really to watch him want to kiss and hug her all the time. As she gets older and closer to crawling, you can find him being her cheerleader too. I love watching them both interact with one another. There is nothing sweeter than siblings bonding! It’s great having a little helper around wanting to always do things for the baby. He grabs her wipes and diapers when she needs changed. If she is bouncing away and drops her toys, he dashes over to retrieve them for her instantly. When she is feeding, he makes sure she has her muslin cloth to catch her drool. 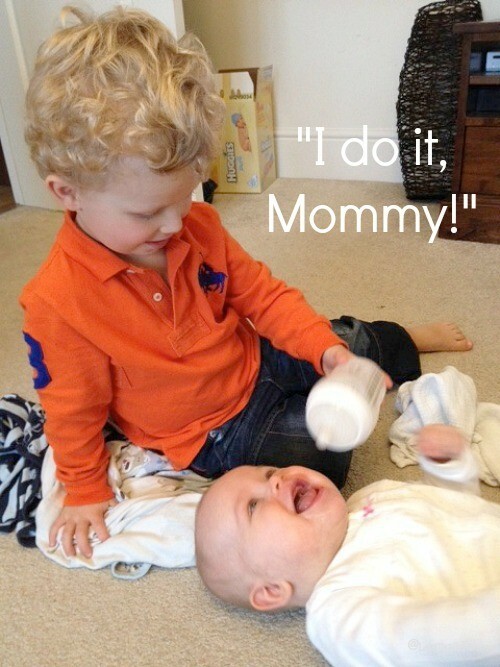 He would do anything for his little sister which is ever so helpful. This week he decided he wanted to graduate from little helper to big helper, being a big boy and all. “Mommy, I do it?” asking me if he could feed Missy Moo her bottle instead of me. It was the first time he has ever asked me. I thought he would only hold it for a second, but I was wrong he sat there, changing hands ever so often as his arm probably started cramping half way through, bless him. But he didn’t stop. He even stopped half way through took a look at the bottle, “its not gone yet Mommy?” amazed that Missy Moo still hadn’t finished. “Do you want Mommy to finish?” I asked. “No, I do it,” popping the bottle back in Missy Moo’s mouth. It was a truly magical moment, I will never forget. Not only watching him be so helpful and loving to his baby sister but the look on her face that he was feeding her, I have never seen her happier. Her big brother is her idol. Feeding times, now are shared between all of us, Daddy, Mommy and Buba. It’s wonderful that they’re developing such a strong bond already. Here’s hoping that they stay close throughout childhood and beyond. Thank you Izzie, me too. I really hope they are the type of siblings that are inseparable always. I was with my siblings and still am. It’s a great bond one I want them to have forever. I am sure there will be plenty of bickering through the years too that’s normal. 😉 Thanks for commenting hope to see you again soon. Thank you Mary. I know, it’s one of my favorites. I couldn’t believe how happy she was looking up at him feeding her. Bittersweet moment for sure. Thank you Amy. Oh well he soon will be big enough to be your little helper, Buba only now can help as he still is young. But when they can it’s so great. Thanks for stopping by and commenting. Hope to see you again soon. What a lovely post about such a precious bond that hopefully will only ever get stronger as they grow. I hope it does, I have seen siblings super close and siblings that don’t speak, I hope the first for them. I wouldn’t miss your magic moments ever! 😉 Thanks for hosting a great linky. 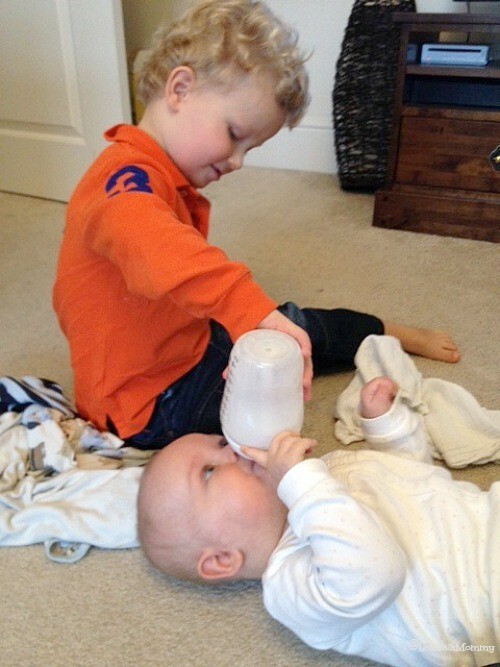 It’s great when you can get older siblings involved in caring for the baby. 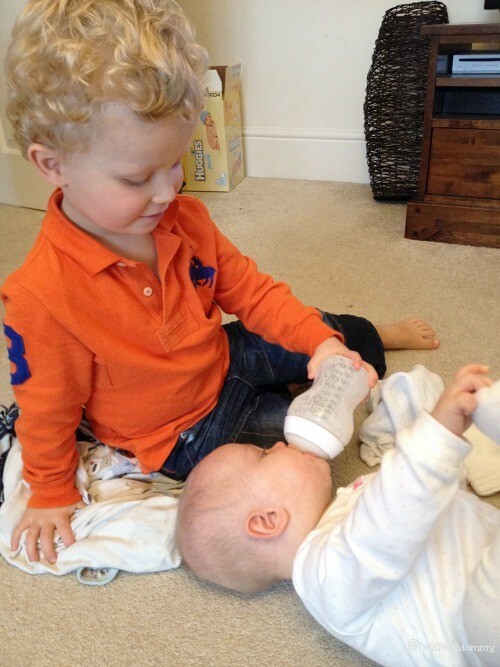 It helps them to feel needed and develop a stronger bond with their sister of brother. Thanks for your comments and stopping by. Yes, I totally agree with you. I struggled at first because my oldest wasn’t old enough to help out but he slowly is getting to the point where he can do little things like hold a bottle or fetch a diaper. Its so bittersweet to watch them grow together. That’s soo cute and his little baby sister visibly adores him. I think you have a great little assistant there! Thanks. I know I was so excited when he finally got to an age where he understands grab mommy a diaper or hand mommy this or missy moo her dolly etc. hahaha He is growing up way too fast though. They both are. Aww! Definitely a #MagicMoment – I love the huge smile she has on her face and the look of being very gornw up on his! 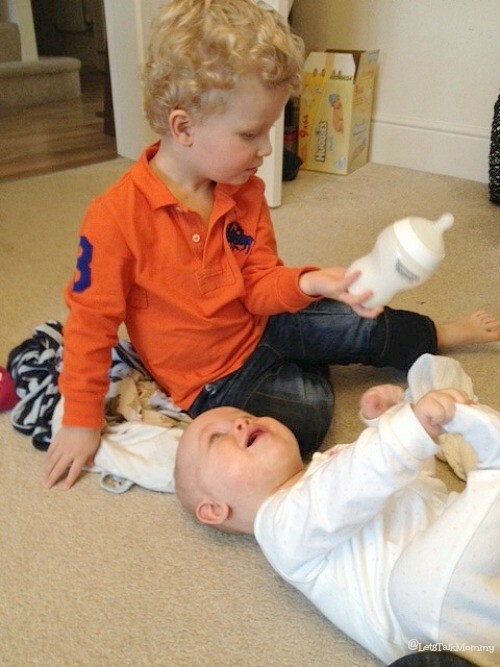 Love the photo of him checking the bottle! Thanks I do too. I love that he is old enough now to help me with these. A few months ago, he wasn’t. It’s great watching them learning things together.